Posted March 26, 2019 by Seán Kinane & filed under News and Public Affairs, Transportation. The Florida Department of Transportation has proposed a major regional overhaul called Tampa Bay Next; it involves widening interstate highways, but also includes transit, facilities for bicycles and pedestrians, “complete streets,” and freight mobility. 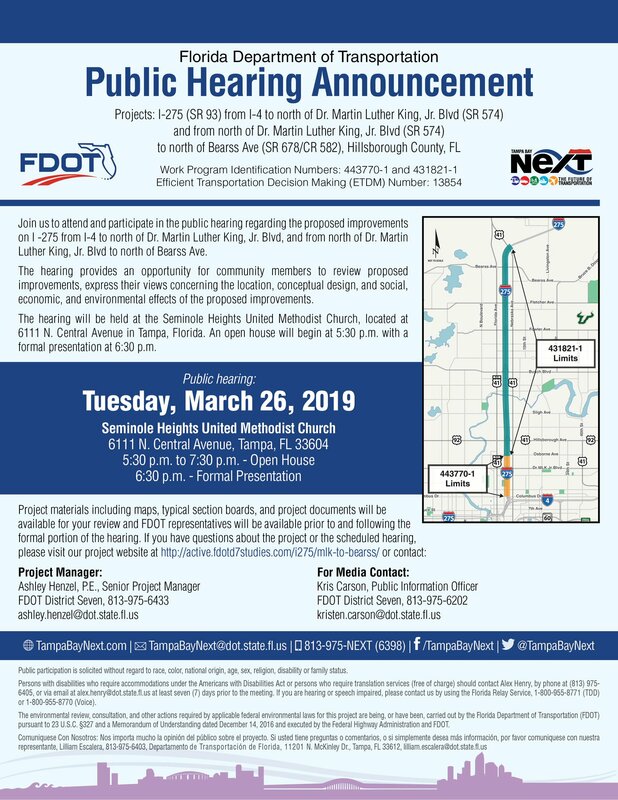 Tuesday in Seminole Heights there’s a chance for the public to find out more and to weigh in on a segment proposed from the I-4 / I-275 interchange north to Bearss Avenue. WMNF News interviewed Kris Carson, a spokesperson with FDOT. The first hour will be a time for people to review maps and documents that are there. And the second [hour] will be a prepared presentation from FDOT? People can talk about things like the location, conceptual design, the social, economic and environmental affects of the proposed improvements. Besides widening it by one lane, what are some of the other improvements that you potentially plan on making on that stretch of I-275? “The big part of the project will be the one lane in each direction. There’s also looking at providing transit accommodations on the inside shoulder. The location and the time again? By 2017, Tampa Bay Next emerged as a replacement for – and critics say a re-brand of – what used to be called TBX. One of the most criticized aspects of the plan is proposed “express toll lanes” on area interstates.